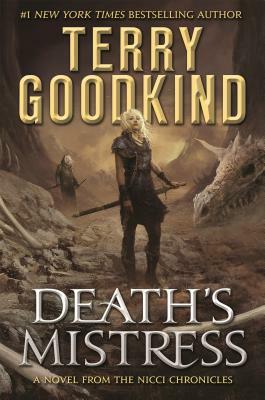 A New York Times bestseller, Death's Mistress: Sister of Darkness begins The Nicci Chronicles, Terry Goodkind's series with a cast of characters centered on one of his best-loved characters in the now-concluded Sword of Truth. One-time lieutenant of the evil Emperor Jagang, known as “Death’s Mistress” and the “Slave Queen”, the deadly Nicci captured Richard Rahl in order to convince him that the Imperial Order stood for the greater good. But it was Richard who converted Nicci instead, and for years thereafter she served Richard and Kahlan as one of their closest friends—and one of their most lethal defenders. Now, with the reign of Richard and Kahlan finally stabilized, Nicci has set out on her own for new adventures. One of her jobs will be to keep her travelling companion, the unworldly prophet Nathan, out of trouble. But her real task will be to scout the far reaches of Richard Rahl’s realm. This will take her and Nathan to visit the mysterious witch-woman Red, to tangle with the street life of the port city of Tanimura, to fight lethal battles on the high seas, and ultimately to a vast magical confrontation far from home…with the future of life itself, in the Old World and the New, at stake. Full of life and story, this is a sweeping, engaging tale in the grand Goodkind manner. Terry Goodkind is a #1 New York Times bestselling author. His books include the eleven-volume Sword of Truth series, beginning with Wizard’s First Rule, the basis for the television show Legend of the Seeker. Goodkind was born and raised in Omaha, Nebraska, where he also attended art school. Alongside a career in wildlife art, he has also been a cabinetmaker and a violin maker, and he has done restoration work on rare and exotic artifacts from around the world -- each with its own story to tell, he says. While continuing to maintain the northeastern home he built with his own hands, in recent years he and his wife Jeri have created a second home in the desert Southwest, where he now spends the majority of his time.